Ricky Rubio initial presence on the NBA scene seemed to be a basketball myth. A dynamic passer with amazing court vision and ball-handling abilities, he evoked images of Pete Maravich. He was drafted by the Minnesota Timberwolves in 2009, but remained overseas for two seasons. Although it was inevitable that Rubio would eventually make his way over to the NBA, critics wondered if his abilities could match up to the athletes he would face in the NBA. 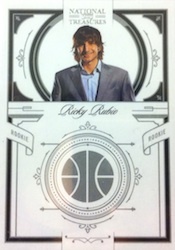 Thus far, Ricky Rubio cards and memorabilia have been up and down in the hobby. In spite of lockout concerns, Rubio decided to join the team for the 2011-12 season and suffice it to say, those critics have been silenced. Rubio's arrival in the NBA meant that collectors finally had a starting point for the young point guard and his promising future. Rubio has just eight rookie cards and they are evenly distributed among all budget levels. 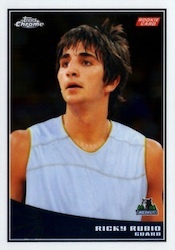 The 2009-10 Upper Deck Exquisite Ricky Rubio rookie card is the clear favorite among collectors. 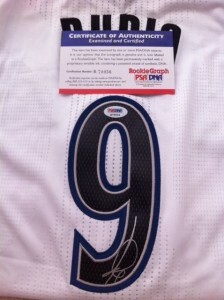 The simple design features an image of Rubio directing his team as well as an on-card autograph and serial numbering. The card is limited to 225 copies and will remain a top-draw for collectors. There is another version (card #73) in the base set that is very similar. 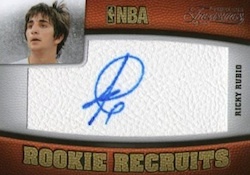 The card is also signed and showcases another image of Rubio. Some consider it a rookie, others do not. 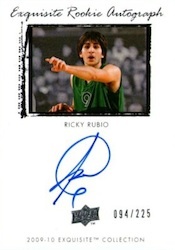 The 2009-10 Timeless Treasures Ricky Rubio card features a somewhat limited print run of 299 and while not technically on-card, the cut-style autograph is still much more desirable than a sticker. The design seems forced and the awkward image of Rubio in the corner further adds to the confusion. All things considered, this card would not normally be considered a top option. 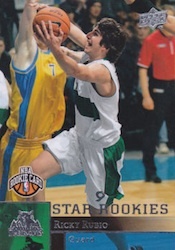 However, as one of the only two autographed rookie Ricky Rubio cards and limited availability, Timeless Treasures makes the list because of the positive aspects it brings, not the card as a whole. Rubio's National Treasures card is the only unsigned card in the top three. Numbered to 99, it is part of the elite National Treasures brand. Even without his signature, the card commands strong values. If it was signed, it would be the undisputed king of Ricky Rubio cards. The set does feature a signed insert of Rubio as well. The autographed card is part of the Century Signatures set and is also numbered to 99 but is not a true rookie. 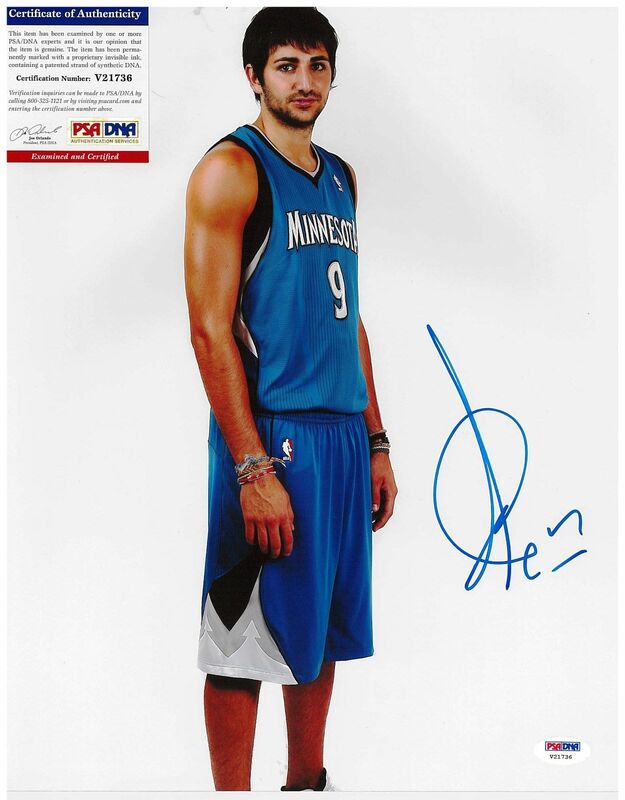 Below you will find an example of what Ricky Rubio's authentic signature looks like. This can be used as a first point of reference for determining the legitimacy of autograph memorabilia, but is not a substitute for having your items authenticated by a well-respected professional autograph authentication company. Reputable authentication companies include JSA, PSA, Panini Authentic and Mounted Memories to name a few. Click on any of the images below to view full size photos. Overall, a complicated signature to decipher. Look for a long vertical line on a 50 degree angle; a flattened triangle shape exists on the outside left of the line. A large character resembling a "@" is the primary focus of the signature. 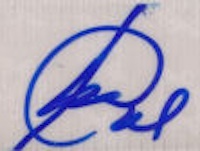 The signature ends with what looks like a lower-case cursive "l."